CHINESE: Luo shen hua, Mei gui jia, Shan jia zi. GERMAN: Afrikanischer Eibisch, Hibiscus-Tee, Karkade-Tee, Roselle, Rote Malve. FRENCH: Oseille de Guinée, Thé rose d'Abyssinie. JAPANESE: Roozera, Roozeru, Rozerusou, rohzelu. POLISH: Hibiskus szczawiowy, Ketmia szczawiowa. PORTUGUESE: Caruru De Guine (Brazil), Quiabo Da Angola (Brazil), Rosela, Vinagreira. THAI: Krachiap, Kra chiap daeng. Roselle is an erect, branched, nearly smooth annual herb, 1 to 2 meters in height. Stems are purplish. Leaves are 8 to 12 centimeters long, variable in shape, entire or deeply 3- or 5-lobed, the lobes oblong to oblong-lanceolate. Calyx is somewhat hairy, lobes are pointed, connate below the middle, forming a fleshy cup. Corolla is pink with a dark center, about 5 centimeters long. Fruit is ovoid, pointed, hairy, about 2.5 centimeters long, enclosed by a fleshy and enlarged calyx. - Planted for ornamental purposes and its edible calyces. - Native of tropical Africa. • The dried calyces yield among others: cellulose, insoluble and soluble ash, tartaric acid, malic acid. • Calyces are high in calcium, niacin, riboflavin, and iron. • Food value per 100 g of fresh edible portion: Moisture 9.2 g, protein 1.145g. fat 2.61g, fiber 12 g, ash 6.9 g, calcium 1,263 mg, phosphorus 273.2 mg, iron 8.98 mg, carotene 0.029 mg, thiamine 0.117 mg, riboflavin 0.277 mg, niacin 3.765 mg, ascorbic acid 6.7 mg.
• The flowers yield a coloring matter that contain gossypetin, quercetin, hibiscetin and free protocatechuic acid. • Bitter seeds contain 20% oil with 26% albuminoids. • Leaves yield oxalic acid. • Analysis of unextracted (UE) and extracted (E) roselle seeds showed 15.36% (UE) 27.50% (E) digestible crude protein, 75.81% (UE) 68.83% (E) total digestible nutrients, 84.06% (UE) 64.23% (E) starch value, and 3184 kcal/kg (UE) 2891 kcal/kg (E) calculated metabolizable energy. • Leaves considered emollient, stomachic, scorbutic and febrifuge. • Seeds are diuretic and tonic. • Flowers considered tonic and aperitive. • Studies have suggested antihypertensive, cardioprotective, hepatoprotective, antioxidative, antimicrobial, hypolipidemic, uricosuric, antiviral, antiobesity, antimutagenic, antiatherosclerotic, antiviral, anticancer, neuroprotective, nephroprotective, antidiabetic, antianxiety, antidepressant properties. • Cultivated ornamentally and for the red and fleshy calyces that surround the fruit and used for the preparation of jellies, wine and other food products. The jam, jelly, and sauce are similar in appearance and taste to cranberries. • Young leaves used as a substitute for spinach; used in cooking of curries, meat or fish, and the native dish "sinigang." • In Myanmar, green leaves are the main ingredient in making chin baung kyaw curry. • Leaves used as emollient. • Lotion made from leaves used for sores. • Decoction of seeds used for dysuria and strangury; for mild dyspepsia and debility. • In Brazil, drink made from the plant, considered refrigerant and used for fevers. Used as stomachic and emollient. • A boiled drink prepared from the fruit and calyx, dashed with salt, pepper, asafoetida and molasses, used for biliousness. • Fruit used as antiscorbutic. • In Chad, infusion of calyces used for plethora, bronchitis and coughs. • Heated leaves applied to cracks in the feet; also, to boils and ulcers to hasten healing and maturation. • In India seed decoction used for dysuria, strangury and mild dyspepsia. • In Nigeria, seed decoction used to enhance or induce lactation in cases of poor milk production. (see study below) (27) Used as antihypertensive drug. - Fiber: Plant yields bast fiber from the stems; used a jute substitute in making burlap. - Coloring: Plant yields a coloring matter used for food coloring. • Antioxidant: A study showed the protective role of extract of HS against lipid peroxidation and suggests an antioxidant potential to be used for therapeutic purposes. • Safety Study: Study concludes Hibiscus sabdariffa is probably a safe medicinal plant, short-term administration of the HS did not show harmful effects on body water and electrolyte levels. • Studies in healthy volunteers showed altered chloroquine, acetaminophen and diclofenac pharmacokinetics. (32) Hypotensive effects might be of concern in patients on antihypertensives. - Teas and extracts in the cybermarket. A Study of the Staining Effect of Roselle (Hibiscus sabdariffa) on the Histologic Section of the Testis / Egbujo E, Adisa O J, Yahaya A B / Int. J. Morphol., 26(4):927-930, 2008. Hibiscus sabdariffa L. tea (tisane) lowers blood pressure in prehypertensive and mildly hypertensive adults/ McKay DL, Chen CY, Saltzman E, Blumberg JB. / J Nutr. 2010 Feb;140(2):298-303. doi: 10.3945/jn.109.115097. Epub 2009 Dec 16. Bioactivity of anthocyanins from Hibiscus sabdariffa / Sindi, Hebah Abbas / 2013, PhD thesis, University of Leeds. 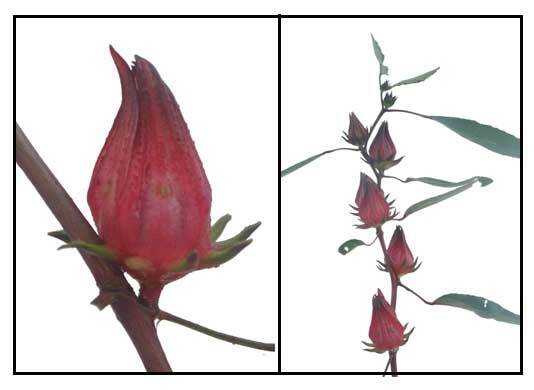 Uricosuric effect of Roselle (Hibiscus sabdariffa) in normal and renal-stone former subjects. / Prasongwatana V, Woottisin S, Sriboonlue P, Kukongviriyapan V / J. Ethnopharmacol., 22 May 2008; 117(3): pp 491-495 / doi: 10.1016/j.jep.2008.02.036. Effects of Hibiscus sabdariffa Linn. on Malondialdehyde and Glutathione Peroxidase in an Overtraining Rat Model characterized by Growth Hormone, Insulin-like Growth Factor-1, and Insulin-like Growth Factor Binding Protein-3. / Ilyas I. I, Kartinah N. T, Andriani T, Goernarjo R. A, Kahanjak D. N, Freisleben H. J. / Biomed Pharmacol J, 2017; 10(1).